Broadband optical metasurfaces are gaining enormous attention owing to their potential applications in optoelectronic devices, sensors, and flat optics. 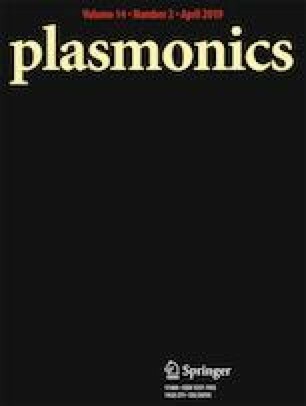 Here, we demonstrate for the first time a single-step, novel wet-chemical etching-based nanofabrication method to produce broadband random plasmonic metasurfaces (RPMS). The nanofabrication method is inexpensive, simple, versatile, and compatible with semiconductor processing technologies. The RPMS is made of a single-layer optically thick Ag thin film nanostructured with random nanoholes and nanocavities. The building block of the RPMS is a multi-resonant meta-cell composed of disordered nanoholes with variety of sizes, shapes, and aspect ratios. The composition of the multi-resonant meta-cell can be modified by varying the duration of immersion (DoI) of the Ag thin films in the etchant solution. The RPMS exhibits broadband extraordinary transmission in the 550–800 nm wavelength range with an efficiency of transmission of 2.3. Broadband absorption of light is observed in the entire visible region; incident light is strongly absorbed (~70%) in the nanocavities via localized surface plasmons (LSPs) in the 400–550 nm wavelength range. Further, 40–50% of the light is absorbed in the metal film via surface plasmon polaritons (SPPs) excited by the multi-resonant meta-cells, elsewhere on the spectrum. The RPMS exhibits Lambertian type scattering with nearly 50% efficiency in the entire visible wavelength range. The RPMS with these broadband optical properties can find useful applications in plasmonic solar cells, surface-enhanced Raman spectroscopy (SERS), thermoplasmonic devices, and plasmoelectric potentials based all-metal optoelectronic devices. The online version of this article ( https://doi.org/10.1007/s11468-018-0813-4) contains supplementary material, which is available to authorized users. The authors would like to acknowledge the support of Dr. M. G. Sreenivasan (Technical Manager, Hind High Vacuum Company Pvt. Ltd. India) in performing the optical spectroscopy measurements for the present study. Dr. V. H. S wants to acknowledge Dr. R. Bhattacharya, Honorary Adjunct Professor, IIEST, Shibpur, India for introducing him to the exciting field of plasmonics. The authors would like to thank the Department of Science and Technology (DST), India (Grant no: DST/TM/SERI/2K10/63(G)) and Department of Biotechnology (DBT), India (Grant no: BT/PR12874/NNT/28/452/2009)) for financially supporting the research work.